Very Good. Great shape. Audio CD Used-Very Good 2004mment. Wolfgang Amadeus Mozart. Very Good. In very good packaging. 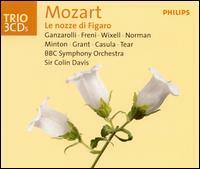 Wolfgang Amadeus Mozart-Le Nozze De Figaro (Davis, BBC So, Norman, Freni, Wixell) by Wolfgang Amadeus Mozart.